With just a small bit of ingenuity, turn everyday food into something cute using Kaori’s easy recipe! With a few simple ideas, an ordinary recipe magically transforms into a cute dish. 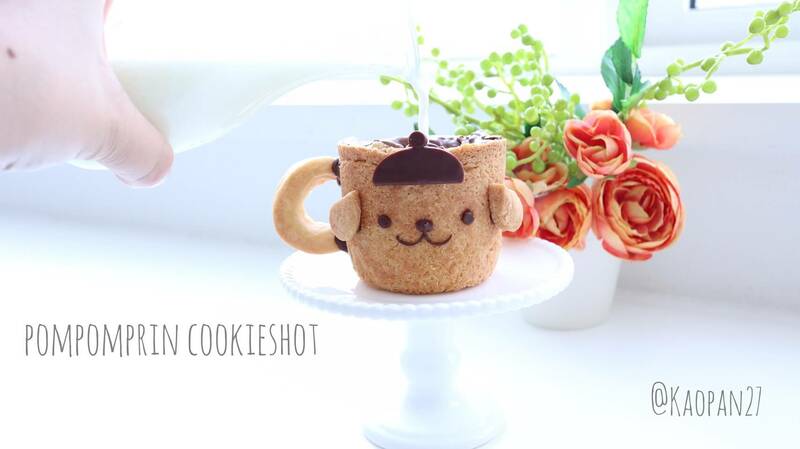 In this recipe you’ll learn how to make a “Pompompurin Cookie Shot,” perfect for Valentine’s Day! It may look difficult but I have made it so it’s nice and easy to make! ①Knead together the unsalted butter, flour and sugar. ②Add the milk in little by little while kneading. Knead until the it has a consistency moister than regular cookie dough. ③Coat one glass with a little oil or butter. ④Affix the dough from step ② around the inside of the glass as shown in the photo below. ✩It’s best to make your dough a little softer than regular cookie dough to prevent cracks from forming. ✩Press the batter firmly to ensure air doesn’t get into it. If you don’t do this then the batter will split. 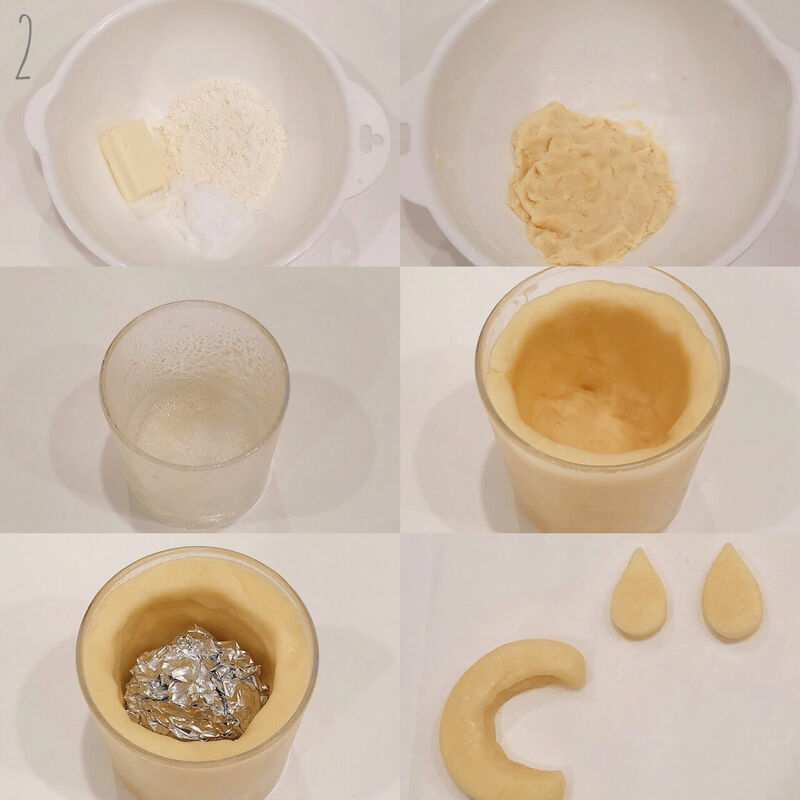 ⑤Place aluminium foil into the centre of the dough to stop it from expanding when baking. 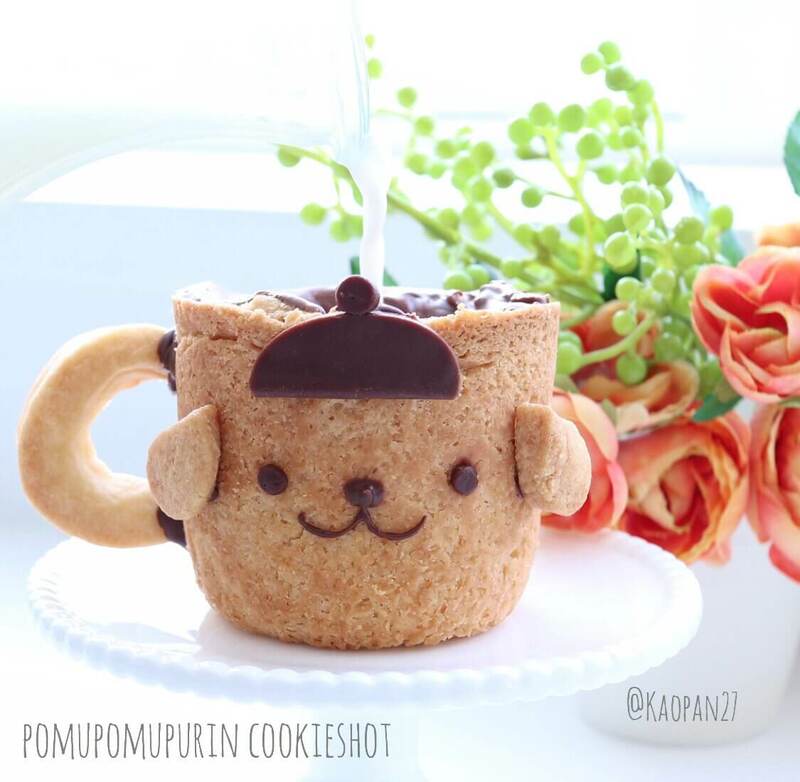 ⑥Shape a cup handle and Pompompurin’s ears with leftover dough from step ④. ✩Bake for approximately 10-minutes at 190° with the handle and ears. Remove the handle and ears and bake the cup for a further 5-10 minutes. 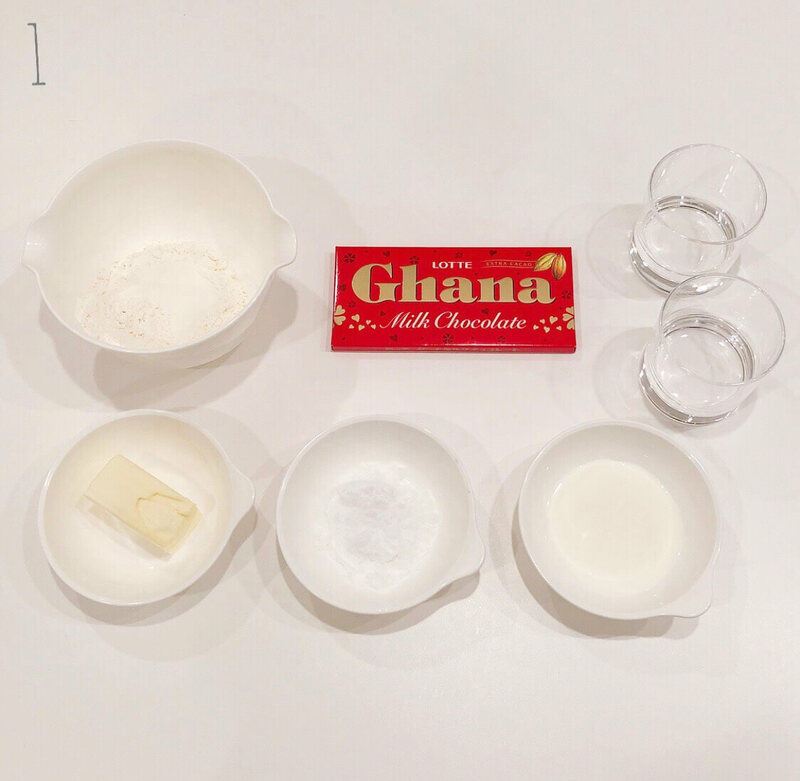 3: Melt the chocolate over a bain marie. 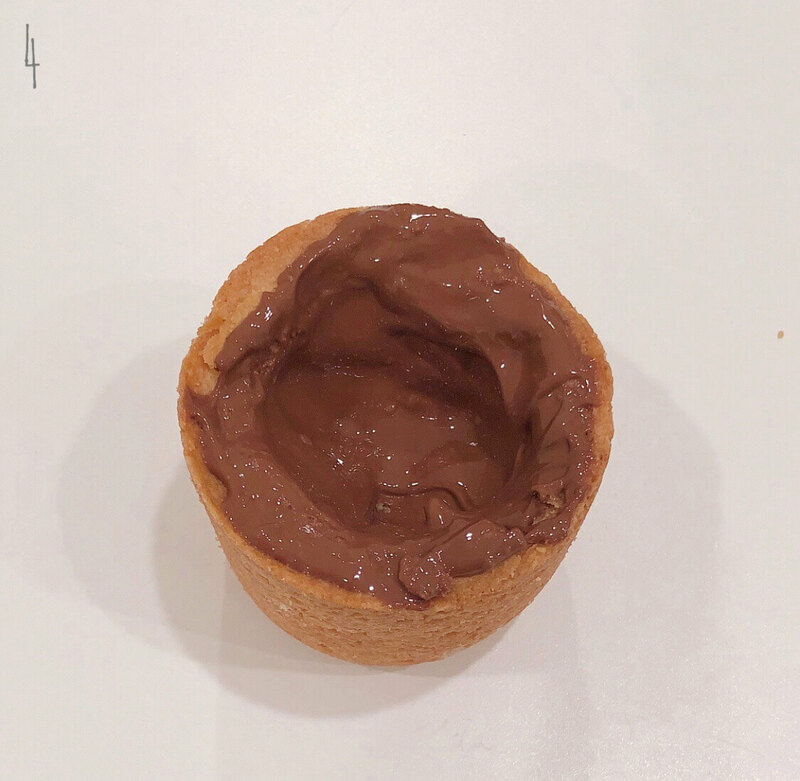 4: Remove the aluminium ball and once the cup has cooled remove the cookie and smear in the chocolate. ✩It’s possible to remove the baked cookie smoothly by coating with butter but it will make it break easily so ensure to do it carefully. The inside of the cookie will look a little uneven after removing the aluminium ball but you won’t be able to see it after adding the chocolate. Once completely cooled use the leftover chocolate to draw on Pompompurin’s facial features and use it to attach the handle and ears. After attaching the handle and ears hold them in place for a moment for the chocolate to harden. You can make a hat from the remaining chocolate but I made one from sliced chocolate. Kaori invites you into her world of character-themed food dishes in her recipe series. Be sure to check out her Instagram where she has uploaded many pictures of her character dishes!